Today, I have Gena of The Full Helping on the blog. She offers a unique perspective on food compared to other interviews I've done here. Eating a plant-based diet out of compassion for the world was a big part of her recovery, as a way to nourish the body and take care of the world as well. It's wonderful to see that everyone has their own unique healing stories. When it comes to food, everyone is unique, and the intention behind eating is important, regardless of what you're eating. 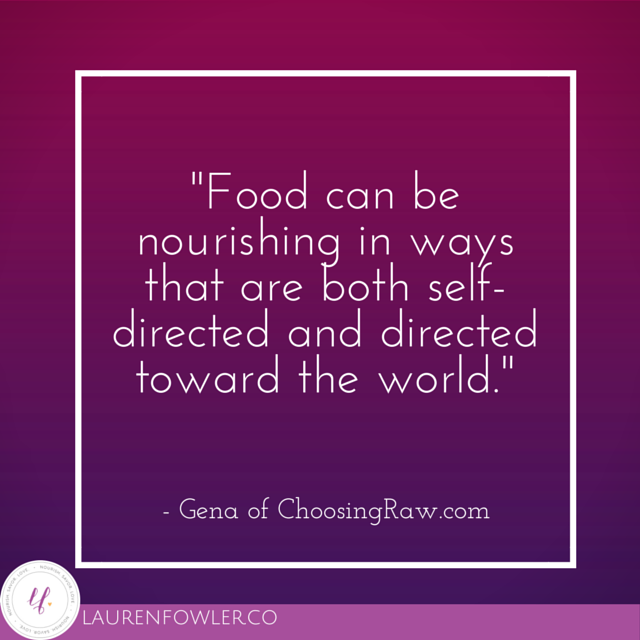 I love Gena's blog for creative, delicious recipes, science-based nutrition, along with a non-judgmental, welcoming perspective for all readers. For one of my favorite recipes, check out her Red Lentil, Sweet Potato, Coconut Curry! Her story here is full of finding compassion through food, along with self-care through writing, therapy, yoga, and more. As always, I'd love to hear your thoughts below on self-compassion, healing your relationship with food, and more! My story begins fairly typically: I gained a little extra weight in late childhood. Around the age of 11, my physician advised me to lose a few pounds, which was well intentioned advice, but in the absence of guided instruction I took weight loss into my own hands, and I took it much too far. That was my first bout of disordered eating. I gained the weight back, but I maintained an uneasy, troubled relationship with food from that point forward. I had two additional relapses: one my junior year of college, one in my early twenties. Along the way, I fortunately became committed to lasting recovery. Therapy, writing, and my switch to a vegan lifestyle were the three defining tools of my healing process. The first two have helped me to remain honest and accountable, while the last has completely transformed my relationship with food. Veganism has shifted my focus away from obsession and outward, toward animals and the planet. It has made me realize that food can be an avenue for doing good in the world. With these realizations comes a deep sense of peace and confidence with my food choices. There are so many, but I can focus in on two major ones. The first was that health and happiness are mutually exclusive with control and body discipline. Like many people with eating disorders, I convinced myself that I could have it all: that I could somehow be obsessive and controlling with my food choices and also kid myself that I was "health-conscious" and self-aware. In the end, I was forced to acknowledge that I cannot be healthy and happy so long as I am also restrictive and controlling and fixated on maintaining a shape that isn't appropriate for me. It was difficult to give up the fantasy that somehow health and rigid control could coexist, but letting go of it allowed me to heal. The second big lesson I learned is that food can be nourishing in ways that are both self-directed and directed toward the world. Healthful ingredients, lovingly prepared meals, and taking pleasure in food can nurture the body. Prioritizing compassion for animals and the planet with one's food choices can be a form of activism and an attempt to change the world for the better. It's hard to remember how I could once have viewed the act of eating as so guilty and so fraught, now that I regard food with so much meaning and positive association. I'm no fan of regrets, so I wouldn't hope to talk my young self out of any of the experiences I've had (with food or anything else!). But I'd hope to see her heal a little sooner; I do feel saddened when I consider the thirteen years I spent at war with food. I'd gently encourage her to consider that life is precious and fleeting, and that there is no point wasting it on shame--or on self-control, which for me functioned as an attempt to combat shame. I'd tell her that pleasure and experience rarely happen without a little mess and mistakes--some big, some small--and that she should be less paralyzed by fears of screwing up and being imperfect. I'd tell her that the people who matter love you as you are--not as some sort of manicured and polished version of yourself. Finally, I'd tell her to lift her gaze up from her plate, and to remember that life is not all about mastering self-discipline. I'd invite her to start framing her food choices in a broad context that includes not only health and wellness, but also the welfare of other living beings. I'd emphasize that things are more connected than she realizes, and hope that she learned to take comfort and inspiration in this fact. Therapy was a huge one. Like many people, I approached therapy with the assumption that I understood myself very well, and that little would be revealed that I didn't know already. Boy, was I wrong about that. My therapist helped me to recognize self-flagellating behaviors, to see how shame was connected to my fixation on self-control, and to develop a set of tools to cope with these urges. Writing has also been enormously helpful. I started my blog while I was still wrestling with some orthorexic gremlins. This has been a source of some shame and regret over time, but it has also been incredible to read over my early posts and observe my own growth, and it has forced me to own my story in ways that are both difficult and strengthening. Nowadays, writing allows me to remain compassionate and heart-centered. I don't think I would be nearly as far along as I am without yoga, which has encouraged me to see, touch, feel, and experience my own body; it was a difficult practice to cultivate, but it is essential to my sense of self and happiness. Finally, reading, listening to music, watching goofy movies with my wonderful partner, cooking, and recipe development all provide me with laughter, creative outlets, and a reminder that life is sweet. Yoga for sure. I practice vinyasa yoga in a hot room daily, and it is an ever-evolving, ever transformative act. Yoga was not easy for me at first: after so many years of disconnect from my body, it was very hard for me to really face myself in the studio. But my life is so much richer for it. Writing, reading, and poetry also keep me inspired and alive. Quiet, solitary walks with headphones do me a world of good, and because I often work from home, they're a much-needed break and breath of fresh air. Cooking and recipe development allow me to connect deeply with food and celebrate my passion for it. Finally, my relationship with my partner is a constant source of inspiration. His positive approach to life is infectious, and our time together--be it deep conversation or just goofing off--keeps me focused on what's important. Well, my blog The Full Helping is a constant work-in-progress, a place where I share recipes, offer community and support around the idea of body positivity and recovery, and the space in which I often sort through thoughts and topics that are on my mind. I also have a nutrition counseling practice, focused on, but certainly not exclusive to, plant-based nutrition, and I adore my clients and the work. I'm in the midst of getting my RD degree part-time, so that I can enhance my skill set as a counselor and deepen my understanding of nutrition science. And finally, I have a new book coming out this fall, in collaboration with Food52, entitled Food52 Vegan. It's a collection of delectable, vegetable-driven recipes that will appeal to any home cook, and I loved working on it. I hope readers will love it too! How do you practice self-compassion and compassion for others or the world in your life?